Federal Reserve Chair Ben Bernanke spoke at the 'New Building Blocks for Jobs and Economic Growth' Conference at Georgetown University in Washington, DC. I was asked to photograph the conference by one of the sponsors, The Conference Board. "Government support for technology research and development must supplement private market research in order to create growth in the economy," Federal Reserve Chair Ben Bernanke said during his speech at Georgetown. 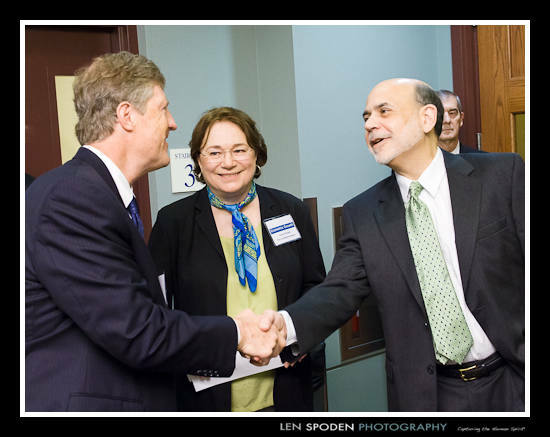 John Mayo, professor of economics, business and public policy at the business school got an opportunity to great Chairman Bernanke before the presentation. More photos can be found by going to the Client Photos tab above.